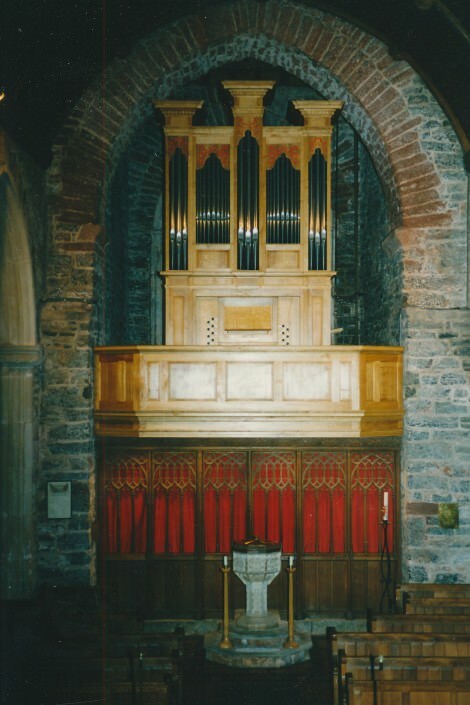 The organ was completed in April 1990. It stands on a new west gallery under the tower. The organ is based on those of Richard Bridge at Christ Church Spitalfields (1735) and St Leonard’s Shoreditch (1756) in London. The manual compass is C – g³, pedal compass C – f¹. The wind system consists of two 6ft x 3ft wedge bellows. The wind pressure is 63mm. The Rector at the time the organ was built was the Revd Grant Brockhouse. The recording is available from www.wyastone.co.uk Nimbus Alliance NI6255 ‘Time stands still’ Elizabethan and Jacobean songs and keyboard music with Simon Ponsford countenor and David Ponsford organ and virginals, using the organ at St John the Baptist Marldon.